Marine Weather Forecasting - Oceans Ltd.
Offshore prediction, prevention and reporting. Oceans Ltd. provides highly accurate site specific marine weather forecasts to clients to aid in decision support ranging from every day activities to weather sensitive operations. The experience and capabilities of Oceans Ltd.’s meteorologists are utilized in a well-balanced man/machine mix to assist the forecaster in the preparation of accurate and reliable forecasts. The company’s marine weather forecast office prepares each forecast after analysing data from a continuous stream of surface and upper air observations, satellite and radar imagery, and numerical weather prediction (NWP) model output from a number of national and international sources. These forecasts are superior to forecasts from other providers who provide forecasts based on only model data only. Oceans Ltd.’s site specific and route forecasts can be delivered in tabular and graphical format via email as an Adobe Acrobat PDF document (view an example) as well as being uploaded to our secure client web portal. Forecasts can be provided in support of offshore operations for any location in the world. Predictions of the motion response of a rig or vessel to forecast sea state conditions are an integral part of Oceans Ltd.’s forecast service. Originally developed in 1999, Oceans Ltd. was the first private weather forecasting company in Canada to develop and implement a motion prediction scheme for offshore installations. Since that time, the company has applied its model to multiple offshore installations, including semi-submersible drilling rigs, drillships, and FPSO’s. The motion response prediction software uses a spectral approach wherein Response Amplitude Operators (RAOs) are applied to a modelled directional wave spectrum. Since the predictions of heave, pitch, roll, surge, sway and yaw use the site-specific sea state forecast parameters as input, the motion predictions are fully consistent with the current forecast at each forecast lead-time. Click here to see a sample data sheet. Oceans Ltd. has worked with Transport Canada to meet all Transport Canada requirements to produce TAFs in Canadian Airspace, and was the first private company in Canada to have been approved by Transport Canada to provide aviation forecasting training courses. Oceans Ltd. is thereby allowed to produce Terminal Aerodrome Forecasts (TAFs) for Canadian airspace in accordance with standards and procedures defined in Environment Canada’s Manual of Standards and Procedures for Aviation (MANAIR). 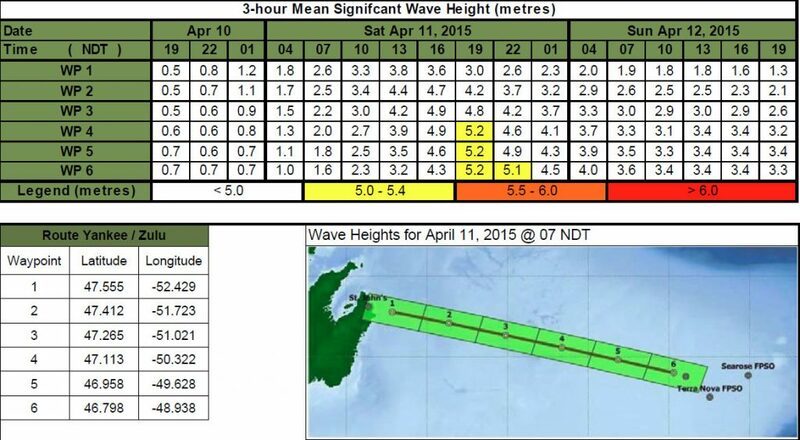 Oceans Ltd can provide a site-specific Long Range marine weather forecast to aid in long-term planning operations. The long range forecast is a similar format to the regular marine site-specific forecast, however covers the period from the end of the short-range portion of the regular marine forecast out to 240 hours. Oceans Ltd.’s Hurricane Response Plan provides the client with timely and detailed weather information when storms of tropical origin are expected to have an impact on weather and sea state conditions at offshore locations. The forecast products distributed to the client contain the expected tracks and intensities of storms of tropical origin in relation to the forecast location and draw upon official forecasts issued by the Canadian and US National Hurricane Centres. A detailed discussion of the evolution of the storm system, along with the effects of the storm on conditions at the site is included. The Hurricane Response Plan provides all the information required by offshore personnel to aid in the decision making process, including information on possible weather escape routes in the event that a vessel or installation needs to be moved from location. Click here to see a sample Tropical Update Statement. The Oceans Ltd. Weather Office will issue a Storm Track Forecast Chart whenever the forecasted 10-metre winds at the site, reaches Storm Force (greater than or equal to 48 knots) at any time before the end of the last valid period of the current forecast issue (generally 54 to 60 hours from the time of issue). The twice-daily issuance of Storm Track Forecast Charts terminates when forecasted winds at the site are no longer at storm force. Changes to the standard issuance time or threshold winds are at the discretion of the client. The Storm Track Forecast Chart depicts the predicted track of storm generating low-pressure centres (including those associated with tropical systems). The track positions, marked every 6-hours and connected by a dashed line, give the central pressure as well as the day and hour relative to Universal Coordinated Time of each low centre prediction. The final predicted position is marked with the letter L above, and the central pressure below. The tracking begins when the predicted storm centre enters the general forecast area (eastern seaboard of North America). The final track position corresponds to either the final valid period of the currently issued forecast (not including the long range period), or the last predicted period of storm force winds at the site, whichever comes first. Oceans Ltd.’s climatological studies support offshore and onshore developments allowing for accurate project progress, project considerations, and project efficiencies. An in-depth study of the climate of a region is critical in understanding what conditions can be expected in the future. Climate studies can aid clients in decision making for the things like where to build structures and what conditions the structure needs to withstand once built. Oceans Ltd. maintains an extensive in-house climatological database extending back more than 40 years of the Atlantic East coast region. Oceans Ltd. regularly provides clients with a number of climatological and data analysis reports. With state-of-the-art proprietary in-house software Oceans Ltd. produces climate reports and results with precision and in depth analysis. Details of some of the standard climatological reports Oceans Ltd. are able to provide are below. Other reports, not specified below can also be provided, should one of these standard reports not meet the client’s needs. Site specific climatological reports can be prepared using hindcast data, or actual measurements should they exist. An analysis of extreme conditions can provide valuable information during the design phase of any project. Oceans Ltd. can prepare an extreme analysis using historical or hindcast data. The extreme value estimates will be calculated for return periods of 1-year, 10-years, 25-years, 50-years and 100-years. 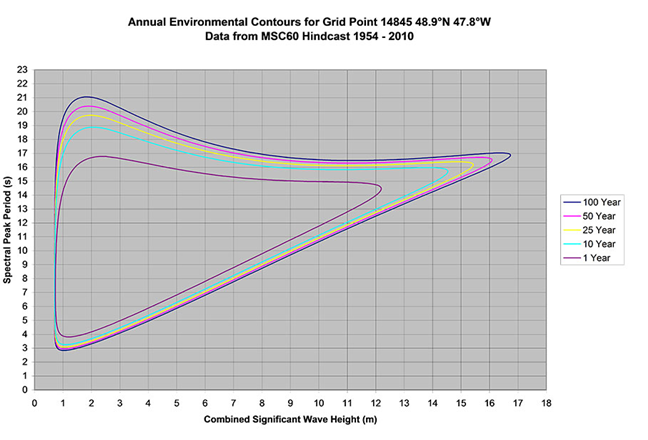 An analysis of extreme wave conditions can be provided through the use of environmental contour plots of significant wave heights versus wave period. The environmental contour plots are typically derived using distributions which fit the observed measurements. A weather window is a continuous period of time during which a certain weather threshold isn’t exceeded, while a weather door represents the opposite. Environmental criteria such as wind speed, combined significant wave height, and vessel motion can all be analyzed to determine the probability of exceeding pre-defined thresholds during a particular time period. Oceans Ltd. is able to provide a marine weather forecasting and ship routing service to ships transiting the entire North Atlantic Ocean. The forecasts are very similar to that given to clients of the company’s site-specific forecasts. This has been deemed to be a very important service as weather data available for mid-ocean regions tends to be sparse; hence marine weather forecasts have been known to be highly inaccurate, particularly during unstable and stormy weather conditions – normally encountered on the rough and frigid seas of the North Atlantic Ocean. 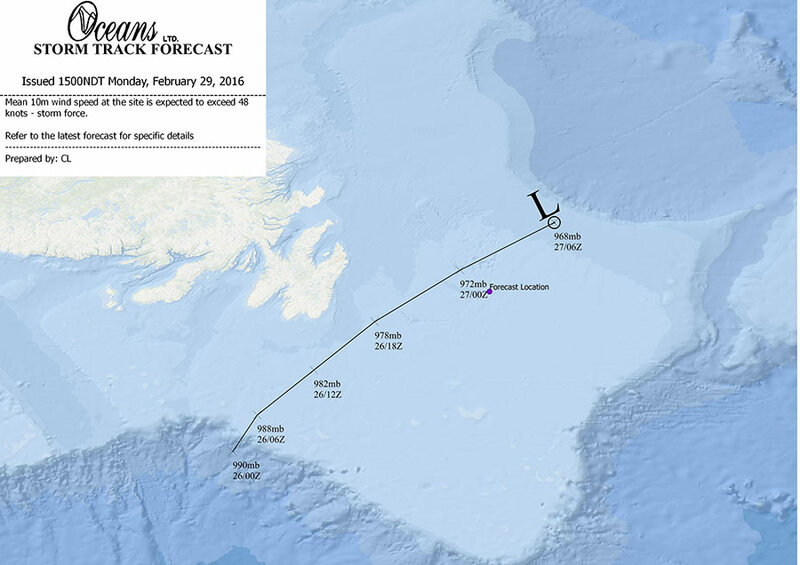 With state-of-the-art technology, Oceans Ltd. is able to provide highly accurate site-specific forecasts along with a ship routing component for ships making the complete journey across the entire North Atlantic Ocean. Weather sensitive coastal packages are also available for marine operators. In fact, a good weather forecasting and ship routing service will provide information to vessel masters that will allow them to avoid all unnecessary risks due to adverse weather conditions. Can Oceans Ltd. provide you or your organization with the scientific insight it needs? Please fill out the following and we will contact your regarding your project. Subscribe and get our latest research, news and updates.